Charlie (Charles) is the great grandson of Paqua Naha (the first Frogwoman) and grandson of Joy Navasie (the second Frogwoman) His mother, Loretta Navasie is also a well-known potter. As a teen, he began learning the craft of pottery making from his grandmother, Joy. He was born in 1965 and is a member of the Parrot Clan. He began working with clay at the age of fifteen. 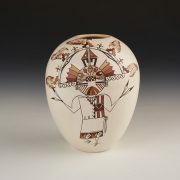 He follows the family’s traditional ware – polished white clay with the designs in vegetal and mineral browns and blacks. 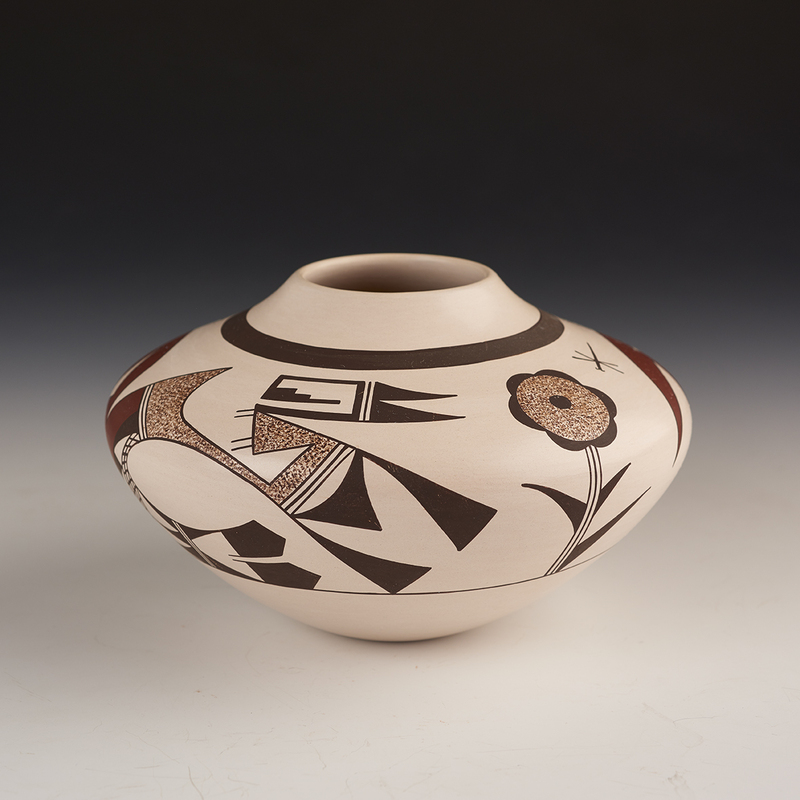 Firing is traditional – outdoor. This piece depicts dragonflies, bird, and flowers. The detailed designs combine both flowing and geometric shapes, providing movement to the piece. This beautiful jar was made in 2000. Charles Navasie was born in 1965 into the Hopi-Tewa Reservation. He is a member of the Parrot Clan. 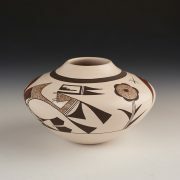 He began working with clay at the age of fifteen. He was inspired by his grandmothers, the late, Pagua Naha, and the renowned potter, Joy Frogwoman Navasie, commonly known as “Frog Woman” to continue the family tradition of making pottery using ancient traditional methods. 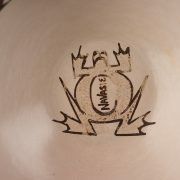 Frogwoman shared all the fundamentals of working with clay and encouraged Charles to continue the family tradition and add to the legacy of their ancestors. 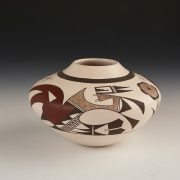 Charles specializes in hand coiling and hand painting traditional seed jars, bowls, and vases. 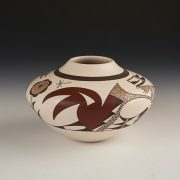 He gathers his raw clay from within the hills of the Hopi Reservation. Next, he cleans the clay until it reaches a fine powder form. Then, he mixes the powder with water. Once the clay reaches a fine medium he begins the hand coiling process and begins the shaping of the vessel by using snake like coils. When the shape of the vessel is determined he sets his product out to dry. 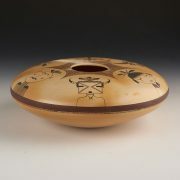 When his vessel is dried he will sand the piece by hand for a smooth finish. Then he begins the hand painting process. The colors used on his his pottery are all authentically hand mixed from natural vegetation which is also harvested from within the Hopi Reservation. Once the vessel has been painted and set out to dry he will complete the process by giving the pottery a traditional firing, the way of his ancestors, outdoors, using authentic sheep dung. Then, he adds a fine polish. 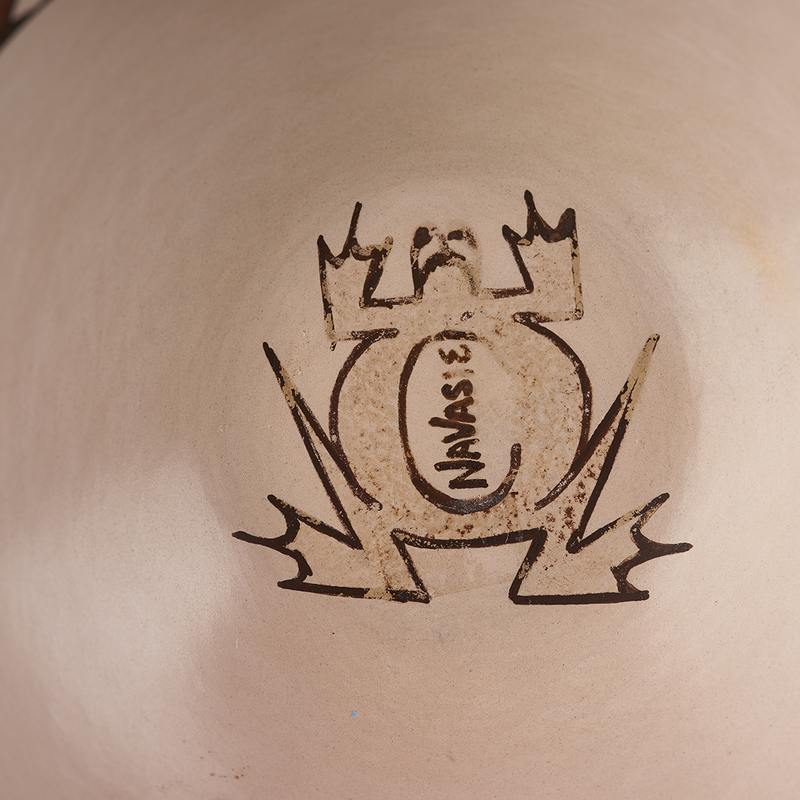 He signs his pottery as: Charles Navasie with a symbol of a frog to denote his family origin.